The tanks blow their way down the street cloaked in a white pall of smoke. Kawsar props herself up on her elbows and looks through the side window. Her neighbours try to flee, hidden in a haze of cement dust, but bright sandals and dresses give them away and the soldiers drop to their knees and shoot at the ghostly figures. Overhead there is the groan of a plane's engines and then sweeping down from the direction of the airport she sees a MIG with the Somali flag on each of its wings. Kawsar feels the air swarm about her and steal the breath from her lungs as missiles peel off the clanging tin roofs of the neighbourhood. Before the civil war era of 1990s Black Hawk Down or the pirates of the Red and Arabian Seas of the 2000s, Somalia was ruled for most of the 1970s and 1980s by General Mohamed Siad Barre. Already there were tensions between the military and the populace, between various groups, especially after Somalia lost its Soviet patronage to neighboring Ethiopia. In her second novel, The Orchard of Lost Souls, Somalian-British writer Nadifa Mohamed traces the lives of three women during the tumultuous 1987-1988 period that preceded Somalia's descent into civil war. It is a snapshot of imperiled lives at the cusp of a cataclysm, but also a testimony to the endurance of hope when all seems to be turning to dust. Mohamad's three characters represent different facets of 1980s Somalian society. Kawsar, a widow in her mid-50s who has lost not just her husband but also several stillborn children buried in her fruit orchard, endures much in her life. Her husband, a policeman, was abandoned by the dictatorship after he proved to be too honest and unwilling to take bribes. Her assault by pro-government forces on the eve of a rally in the northwestern town of Hargeisa sets the stage for much of what follows. Filsan is a corporal, the daughter of a prominent military official who has in turn berated her and protected her from practices such as female circumcision, who has been sent to Hargeisa to help quell the incipient rebel uprising occurring there. Her story symbolizes the conflict between the Marxist-influenced government and traditional Somali customs. Deqo is perhaps the most heartbreaking figure of the three. Orphaned at a young man, never knowing who her father was, Deqo finds her way to the dictator's rally at a local stadium in Hargeisa, hoping that her dancing will earn her a pair of shoes. She ends up being taken in as a maid at a local brothel, where the prostitutes are given names such as "China" and "Karl Marx" in reference to their clientele. 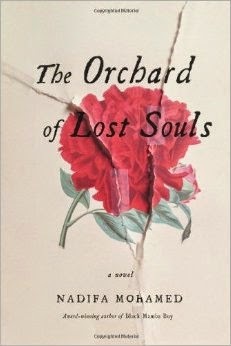 The Orchard of Lost Souls is not perfect, as there are times where each of the three narrators seems to become too passive of observers in the conflict that envelops them, but it does serve as a vividly-told story of hope in the midst in destructive violence. Mohamad's characters possess their own voices and views on the unfolding national tragedy and while at times they might slip too much into the backdrop, on the whole they serve as witnesses for what was happening to Somali women during this time. There is a sense that their stories carry on after the concluding scene and with it, hope is carried with them out of the conflict, where it might bear fruit in a new orchard away from the fighting.